Home Google Tricks How to Picasa PicNic Tech Tip How to do stuff in Picasa Web Picnic? How to do stuff in Picasa Web Picnic? I always felt that there should be a quick way of editing photos when we are using Picasa web without opening the Desktop tool of Picasa. I was told by my friend Peeyush about a new enhancement in Picasa called Picnic but due to some reason I could not look into it. 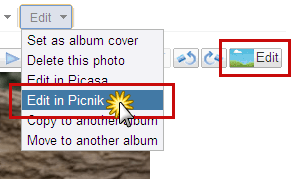 Today when I was uploading my paintings in my blog I went to Picasa web and saw that fancy Blue icon and just out of curiosity I clicked on it, and to my surprise it loaded the new Picnic Functionality. Edit Tab: Lets you auto-size, crop, change image brightness and contrast editing, color setting etc. Create Tab: Lets you add frames,effect, stickers one interesting feature in this tab is the teeth whitening which is very effective. Here is an example of AutoFix feature see how the image quality enhances. The more you explore Picnic the more you will love it.